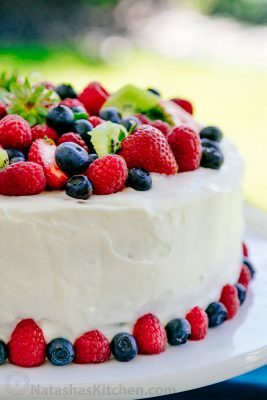 The combination of kiwi, strawberries, blueberries and raspberries worked really well, but you can sub any of the fruit with whatever you like and make this cake your own. The base is a biskvit cake (classic Russian sponge). Preheat Oven to 350˚F. Line the bottoms of two 9" cake pans with parchment paper (don't butter the walls of the cake pans). Combine 6 eggs and 1 cup sugar in the bowl of your electric mixer and beat on high speed for 7 minutes or until tripled in volume and fluffy. In a medium bowl, whisk together 1 cup all-purpose flour and 1/2 tsp baking powder and sift it into the whipped eggs in thirds, folding with a spatula between each addition just until all of the flour is incorporated. DO NOT OVER-MIX or your cake won't rise well. Transfer your dough to your buttered and lined cake pans. Set aside. Bake at 350˚F for 22-25 minutes or until the top is lightly browned. Let the cakes cool down on wire racks, then remove from the pans. Beat together 2 packages of cream cheese and 3/4 cup sugar until smooth (1 min). Add 1 cup cold heavy whipping cream and beat on high speed until fluffy (3 minutes). Slice your kiwi and strawberries into thin rings/half circles. Once your cakes are fully cooled, carefully cut each layers in half using a sharp serrated knife. Place the bottom layer on a cake stand. Spread a thin layer of frosting over it. Cover with sliced kiwi and strawberries. Spread a thin layer of frosting on the next cake layer and place the frosted side down over your fruit. Repeat with the remaining layers and spread frosting over the top and sides. Decorate the top ands sides of the cake with fruit. I placed my larger fruit down first: First Strawberries, then raspberries, followed by blueberries then kiwi. I just placed berries onto the cake until it looked full and pretty. For the bottom border, I cut raspberries in half and alternated the raspberries with blueberries to make a ring around the base of the cake. You can also put kiwi slices around the bottom if you like.